Thanksgiving is often praised as a time for family and loved ones to unite over a grand meal, but the holiday can also serve as the breeding ground for fierce debates ranging from politics to the food itself. Arguably no dish better encapsulates this phenomenon than stuffing, a controversial side that is tearing our editorial board apart at the seams. We enlisted Sports Editor Tyler Kinzy and Conceptual Editor-in-Chief Justin Cupps to lay out the cases for and against stuffing and settle this timeless argument once and for all. It is with a heavy heart I announce that our freedom is under attack. Vicious perpetrators of evil are attempting to divide us and disrupt the values we hold so dear: the unalienable rights of life, liberty and the pursuit of happiness. The haters and losers on the other side seek to spread FAKE NEWS in their blatant witch hunt, which is why I am so graciously donating my time to set the record straight. Simply put, stuffing is a divine creation that we mortals were fortunate enough to stumble upon. Anybody who tells you otherwise is a menace to society and should be locked up indefinitely. Few foods rival properly-crafted stuffing in terms of striking a perfect balance between a savory taste and the overbearing presence of salts and herbs, in addition to possessing a subtle crunch that gives the bread impeccable texture. This Thanksgiving, you should be thankful for hard-hitting journalists, like myself, who actually have the courage to “call it like it is.” In this beautifully-written editorial, we have scientifically proven that no dish can complete a meal quite like stuffing, and only a charlatan such as Mr. Cupps would be foolish enough to claim otherwise. If you do make the ill-fated choice to steer clear of the stuffing at your upcoming Thanksgiving feast, that’s fine by me. It just means more for the rest of us to enjoy. 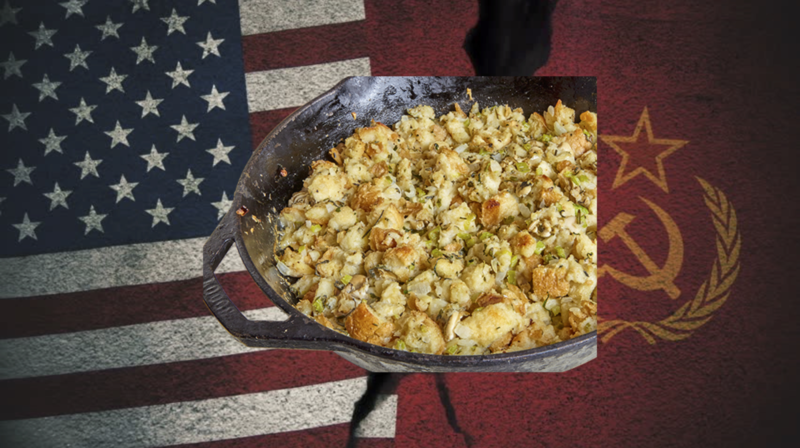 The Pathfinder gives “Stuffing: An American Classic” ∞/10. Why else would “eat dessert first” be such a common catchphrase? People spend weeks thinking about their traditional pie recipes and rush through dinner to get to them….nobody spends all of Thanksgiving Day waiting around for crumbled up bread. It is high time that we–those who declare other foods than stuffing as Thanksgiving supreme–should openly, in the face of the whole world, publish our views, our aims, our tendencies and meet this nursery tale of the stuffing-praising OpEd with a Manifesto of our party itself. We have faced oppression for far too long! It is time for a change: time to usurp this over-glorified pile of vegetables as the reigning Thanksgiving dish! Before my opponent attempts to lock me away in Guantanamo Bay, I wish to pose you a single question: are you a duck? If you, like me, stand firm as non-Genetically Modified Human Being, then join me in exposing the Despicable Pile for what is: nothing but cooked bread and vegetables suited for the ducks. Too many times we have been served this vile atrocity along with many delicacies in an attempt to pass it off as one such, but we are left year in and year out with the same dry, flavorless disappointment. What about casserole? What about fruit salad? What about mashed potatoes? What about cranberry sauce? What about gravy? What about turkey? What about pie? All of these incredible dishes outperform the barely-passable excuse-of-a-side called stuffing by lengths, and everyone knows it. Sometimes, history needs a push, and if I believe in one thing only, it’s the power of human will and how incredibly delicious turkey is. Okay, that’s two things, but you get my point. Defy the oppression of stuffing lovers this Thanksgiving; despise the enemy strategically, but take them seriously tactically. When your aunt asks if you’re going to eat stuffing or, God-forbid, tries to force some onto your plate, stand firm! Slap it from her hand and onto the floor for the family dogs to clean up. When your grandmother comments on how thin you are, only shove more turkey onto your plate! For the love of country and self, defy stuffing lovers this Thursday. The Pathfinder gives “Filthy Mix of Bread and Vegetables” -∞/10. Hey, Copy Editor speaking, I’m pretty sure you spelled “Tofurky” wrong.